When Gov. Mike Easley and the first lady fly in state aircraft, most of their trips include a connection to Brunswick County, where the couple owns two homes. Easley does not reimburse the state for any portion of the coastal trips, although state documents apparently require that he do so. Easley and his wife, Mary, flew on state-owned aircraft 237 days over the past four years, according to records obtained by Carolina Journal from the N.C. Department of Commerce, which is charged with managing the three aircraft available to the governor. The actual period of study was from Jan. 1, 2004 through April 10, 2008. Easley or his wife were transported to the coast, remained there after an “official” event, or were picked up at the coast on 119 days. On 28 additional days the trip request form shows Easley or his wife planned a coastal connection, but the flight logs indicate plans changed and the official business became a round trip originating in Raleigh. A total of 147 trips, or 62 percent, of the Easley’s air-travel days were planned for or had connections to the Brunswick County coast. The Easleys own a home on the Cape Fear River in Southport and another house across the river on Bald Head Island. Only 90 times, or 38 percent of the trips, did the Easleys plan to start a trip in Raleigh, carry out the trip, and return to Raleigh. The manner in which the Easleys use the state aircraft seems at odds with state policy. “An employee traveling on official state business is expected to exercise the same care in incurring expenses that a prudent person would exercise if traveling on personal business and expending personal funds,” the state budget manual states. It also states that “circuitous routes,” meaning roundabout or non-direct routes, are prohibited. The manual provides for elected and appointed officials to incorporate political functions as part of their travel, but the official must reimburse the state for all or a portion of political travel, depending on the nature of the overall trip. “Travel reimbursement policies and regulations for all other travel for state officials is the same as for state employees,” the manual says. The governor and other users are to reimburse the Department of Commerce $560 per hour for the turbo-prop, $770 per hour for the jet, and $770 for the helicopter. Reimbursement for political use is higher, and was recently $1,025 per hour for the helicopter. Easley’s press secretary, Renee Hoffman, defended the trips. She said that Easley is governor 24 hours a day, seven days a week and that Crime Control and Public Safety Secretary Bryan Beatty determines the mode of travel to ensure the governor’s security. According to state law, the use of executive aircraft by the Department of Commerce for economic development purposes takes precedence over all other uses. If an executive aircraft is not being used for economic development purposes, priority of use shall be given first to the governor, second to the Council of State, and third to other state officials traveling on state business. The Department of Commerce operates the aircraft, and all are based at the Department of Transportation hangar at the Raleigh-Durham Airport. They are available to the governor unless they are being used for economic development purposes. They are an 11-passenger Beechcraft King Air Turbo-prop, an eight-passenger Cessna Citation Jet, and a 14-passenger Sikorsky Twin-engine helicopter. If Easley takes the jet, the connection is usually to the Brunswick County Airport, about 120 miles by air from Raleigh. The helicopter flies Easley to the airport, or more often to the Indigo Plantation Parks and Recreation field, which is closer to both of his homes. When connecting with the helicopter from Raleigh, he frequently boards it at the Highway Patrol base in Garner. Other frequent flyers on the state aircraft were UNC Chancellor James Moeser, who made 71 trips, and State Treasurer Richard Moore, who made 46 trips. Unlike Easley’s flights, all of Moeser’s and Moore’s trips appear to be solely for public business, where the trip started and ended in Raleigh. Neither was delivered to or picked up at locations not associated with the public business for which the aircraft were requested. At noon Sept. 2, 2004, Easley took the helicopter from Raleigh to Brunswick County for the grand opening of the Southport Boat Works. The helicopter returned to Raleigh without him, so he presumably stayed in Brunswick County. On Sept. 7, 2004, the jet flew 120 miles from Raleigh to the Brunswick County Airport to pick up Easley. At 11 a.m. it took him to Hamlet, where he announced that Ritz-Craft, a Pennsylvania-based modular-home manufacturer, would build a plant in Hamlet. The jet was on the ground for one hour before bringing Easley back to Raleigh. At noon May 4, 2005, Easley took the helicopter to UNC-Wilmington for an unspecified education announcement. The helicopter was on the ground one hour and 15 minutes before it flew him to Brunswick County. The helicopter then returned to Raleigh without him. On May 9, 2005, the jet flew from Raleigh to Brunswick County to pick up Easley. At 1:45 p.m. the jet took off for a 45-minute flight to Charlotte. There, Easley traveled to the Chamber of Commerce office to announce that Pulte Mortgage would open a processing center and hire 235 workers. The jet was on the ground 50 minutes before it took off to take him back to Raleigh at 4 p.m.
On March 2, 2006, Easley used the jet to travel to Winston-Salem for the dedication of a building at Forsyth Technical Community College. The jet was on the ground one hour and 25 minutes. Afterward, the jet took the governor to Brunswick County, where it left him while the aircraft returned to Raleigh. On March 6, 2006, the jet returned to Brunswick County to pick up Easley. At 1:15 p.m. it flew him to Greensboro and to Charlotte for economic development announcements. He arrived back in Raleigh at 5:30 p.m.
On May 17, 2007, the jet took Mrs. Easley, a state trooper, and an assistant to New York. The jet returned to North Carolina and the trio flew commercially to France. The purpose was a ”museum-buying trip and also to visit Compiegne, which is Raleigh’s sister city,” Hoffman said. They returned to New York on May 25. The jet flew from Raleigh to pick them up and then to Southport to take Mrs. Easley to the coast. The jet returned to Raleigh with the other two travelers. On Nov. 8, 2007, Mrs. Easley and Cultural Resources Secretary Libba Evans took the Beechcraft King Air from Raleigh to Teterboro, N.J. The purpose of the three-night trip was to attend “an official reception for William Ivey Long, the Tony Award-winning costume designer and North Carolina native,” Hoffman said. The plane returned to Raleigh without them. On Nov. 11, the jet went from Raleigh to Teterboro to pick up the travelers. It took Mrs. Easley to Brunswick County before returning to Raleigh. 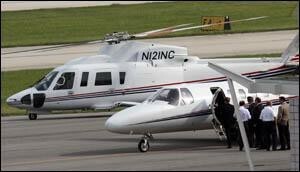 On the afternoon of March 17, 2008, the helicopter flew from Raleigh to Brunswick County to pick up Easley. At 4 p.m. it flew to Rocky Mount, where it was on the ground about an hour for Easley to attend an unspecified event at the Rose Hill Conference Center. Easley arrived back in Raleigh at 7 p.m. The total flying time of the trip was 2.7 hours. At $770 per hour, the total charge to the governor’s office was $2,079. The estimated driving time from the Executive Mansion to the conference center is 50 minutes. Had Easley been in Raleigh he could have traveled by car, apparently at a significant savings. On 28 occasions, the trip request form submitted to the Department of Commerce by the governor’s staff called for a pickup or flight to the coast, but the actual trips taken did not include any coastal connection. For example, a trip request submitted by Easley’s office to the Commerce Department on Feb. 6, 2004, called for the helicopter to pick up Easley in Brunswick County on Feb. 16 and fly him to a Duke power steam station in Catawba County for a brief groundbreaking ceremony. Instead, records show the planned coastal leg was dropped, with Easley taking the jet from Raleigh to Statesville to attend the event, and returning to Raleigh. Easley or his wife made a total of 90 trips that did not include an actual or planned connection to the coast. These were typically trips where the Easleys boarded the aircraft in Raleigh and returned to Raleigh with the aircraft. Easley determines his own schedule and is solely responsible for deciding what public business he or his wife participate in, Hoffman implied. Some of trips appear to be of questionable benefit to the taxpayers. For example, on March 17, 2004, Easley and two aides took the helicopter to Charlotte for the grand opening and ribbon cutting for Hendrick Lexus. On Aug. 11, 2004, Easley took the helicopter to Lowes Motor Speedway for a bill- signing ceremony involving legislation that benefited motor sports in North Carolina. Of the 90 Raleigh-based round trips in the study period, 38 trips, or 42 percent, were flown that year before the November election, in which Easley was running for his second term. For the time period after Easley won re-election in November 2004, the percentage of trips with a planned or actual coastal connection was 68 versus 62 for the entire period. Poole is executive counsel to the governor. The total charge for the three days was $7,174. Flight logs show Easley traveled to Kinston, Monroe, Greenville, Greensboro, High Point, and Smithfield. Department of Commerce Assistant Secretary Kathy Neal said the governor was to be issued an invoice at the end of May. Clinton’s campaign will reimburse North Carolina for the trips, Hoffman said. The governor also used the state jet to bring actor Andy Griffith to Raleigh to participate in Easley’s second inauguration ceremony. On Jan. 15, 2005, the jet flew from Raleigh to Manteo, picked up Griffith and his wife, Cindi, and returned to Raleigh. The next day Griffith had a brief role in Easley’s inauguration ceremony. That afternoon the jet flew the Griffiths back to Manteo. An e-mail from 1st Sgt. Alan Melvin, of Easley’s Highway Patrol Protection Detail, explained the trip: “Ref ‘Sheriff Taylor’… This is low key. Trooper will pick up on the tarmac directly from the aircraft on Friday.” Notes on the flight logs state that the cost of the flights was to be billed to the governor’s office. Griffith had recorded a television commercial endorsing Easley that aired during the campaign. CJ requested the flight records of all three state aircraft since January 2004. The study period ended April 10 this year. Assistant Secretary of Commerce Kathy Neal provided records that included a trip request form from each user, associated notes and e-mails, as well as the actual aircraft flight logs completed by the pilots. The flight logs contained the names of each passenger on each individual leg of a trip. Neal said that flight records associated with active and unannounced economic development projects are not public records, so those were excluded. The flight records for Clinton were received at a later date and were not included in the 237 flights reviewed for this story. CJ staff then analyzed the records to determine how the aircraft had been used during the study period. Don Carrington is executive editor of Carolina Journal.